Fine, I'll admit it, I'm a carbo junkie. Worse than that, I actually know how to make snacks and general... junk. When I set my mind to it, I do it well. I guess the spirit of competition comes in and I will refine the recipe until it's perfect. Or at least as perfect as I intend it to be. Pretty much like anything, if you set your mind to doing something, you'll achieve what you set out. Throw yourself into something complex and who knows what you will get. Thing is, that sometimes, you can be too effective. My freezer is chock full of baked goods. Yesterday I decided I wanted to have some cake for today, my 19th anniversary. With no butter in the house, that set off a chain of events that basically emptied the cupboards and the freezer and taught me how to store butter in a tiny little space. Put a measured 1/2 cup in a sandwich sized plastic bag and flatten. It will go down to a very thin size and will fit anywhere. Repeat as needed. No butter means, churn butter for baking. I had bought some 36% heavy whipping cream from GFS Marketplace earlier this week knowing I'd want biscuits. Once I churn butter, I end up with butter and buttermilk. So... the recipe is simple and I've written about it before. Takes 5 minutes. I did it twice. With the kitchen counters beginning to pile up with mixing bowls and measuring spoons, I set onto the epic. Three hours of Baking Frenzy. Now with the butter, I looked at what I would have to do. The original idea was Cake... but since the oven was going to be hot, I would have to make the biscuits, and it was getting late... Lunch time! Getting ahead of myself, the morning was done and the afternoon was filling up. The list was going to be long but I had to stage everything. There's the plan, set out all the butter in little measuring cups in the refrigerator, and then just combine my ingredients as needed. This would be Bright Idea Number One. Ok, Bright Idea Number Two, make some Pigs in a Blanket. There is always a little bit of extra biscuit batter in the bottom of the mixing bowl and if you try the biscuit recipe, it works incredibly well. Just take the batter, wrap a good quality sausage or hot dog in it, and bake it on it's own cookie sheet with the biscuits. Breather time... while the biscuits are cooling, rinse everything out. All of this baking was going to be done one after another and I only have one mixer here. The Pigs in a Blanket were good, so time to move on. While being watched for anything that would suffer deceleration trauma on the floor by the dog, I moved onto the cake. There were 12 biscuits that were cooling and got moved over her head onto the dining room table. Begin mixing all of this up and realize I had to figure out how to store all of this. There was going to be a cake which would glower at me from the refrigerator. By the time the fourth day was done, the cake would be dry and not so very good. This time things would be different, I would do it RIGHT! Remember the comment at the bottom of the recipe for the cake itself though, Sift the Flour. Otherwise it will turn out dry. But that didn't really decide what to do about having too much of a good thing. Bright Idea Number Three instead of making a three layer cake once, make a two layer cake twice. Having the baking pans in front of me, I realized that it was easier to slice a cake before it is iced to make a smaller footprint in the oven but what to do with the "rest". I made two 9 inch pans of cake and when they cooled, I put one in the freezer for a couple days. 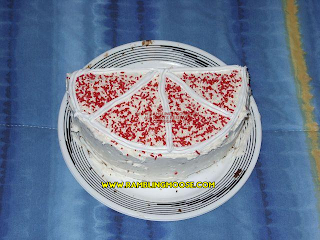 The other one got sliced down the middle, iced and presented as the picture you see on the page. I guess that solved it. We had fresh cake yesterday, we will have sort-of-fresh cake today, and when that one is done we can have another in a couple days. 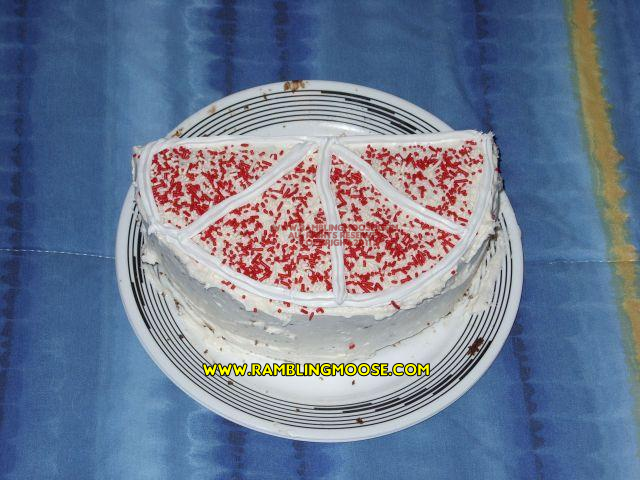 Empty the freezer to create space so a 9 inch round slab of cake fits in your own freezer. I'll wait. See not so easy! I now have freezer blocks of "ice" all over the kitchen. They don't fit with the cake in there, and I couldn't put the cake on top since it would flop over the sides and you'd end up with a Salvador Dali cake, all droopy and melty and that is even before your cake gets out in the rain. Anyway, the cake was out, I could turn off the oven and make the icing which was an easy recipe. First rinse everything again, spilling water on the counter, my cargo shorts making it look like there was red wee all over the front from the food coloring that was on the counter, and water all over the dog. Add to it the water from the condensation from the "ice" blocks warming to temperature and I was creating my own "Waterworld". She didn't like it either. Icing was a success, it turned out very light and fluffy and it is a bulletproof recipe even when you make it "black" or some other color. After last week, I wanted white. Or did I. Getting silly with Jimmies is one of the fun things you can do while baking, so I turned it into a big blood orange slice. I did spill more Jimmies on the floor and there by apologizing to the dog to turning her into a wet sponge for counter slop. But the results were tasty, I have extra icing to do it all again and a very full refrigerator. After all... I have a 9 inch cake layer in the freezer and I know how to use it!